WFN: World Fishing Network, the leading entertainment destination and digital resource for anglers throughout North America, has partnered with the National Parks Conservation Association (NPCA), the nation’s leading voice for our national parks, in the year-round effort to raise awareness for the lifeblood of our nation – the great waterways of North America. NPCA’s America’s Great Waters program was founded in 2009 to support a larger national effort to protect, preserve and restore our nation’s most iconic waterways, which run through and surround America’s 401 national parks. The health of America’s national parks is directly linked to the health of the waters that surround and flow through them. These 21 Great Waters can be found coast-to-coast and include the Chesapeake Bay, New York – New Jersey Harbor, the Everglades, the Colorado River, the Great Lakes, Puget Sound and more. To help advance this work, NPCA partners with more than 60 conservation organizations from across North America through its leadership in the America’s Great Waters Coalition, which NPCA co-chairs along with the National Wildlife Federation and Chesapeake Bay Foundation. Other members include Audubon, Trout Unlimited, American Rivers, Restore America’s Estuaries and the Izaak Walton League, one of the oldest conservation societies in the world. WFN will work directly with NPCA to create a comprehensive program that will tell the stories behind these invaluable resources, raise awareness about the issues facing these waterways, and actively promote opportunities to improve the health of our nation’s Great Waters. The result will strengthen the connection between anglers, the watersheds and the species that inhabit them. 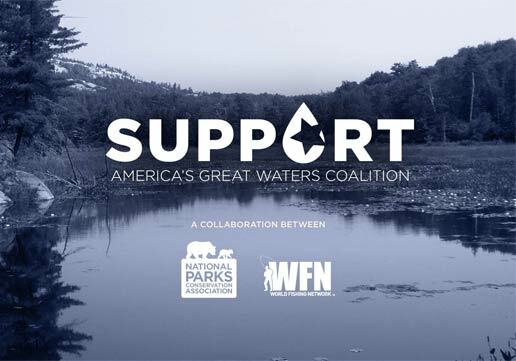 As part of the partnership between WFN and NPCA, the Support America’s Great Waters awareness campaign will engage components throughout the WFN linear and digital franchise: television, digital microsite, social media, general publicity and third-party platforms. Increasing recreational access sites and minimizing pollution threats to the Chesapeake Bay, such as storm water runoff from fertilizer, chemicals and sediments; municipal wastewater and industrial waste; airborne nitrogen and toxic mercury from power plants and motor vehicles. Supporting the restoration of the Everglades by advancing projects that remove levees, fill in canals, reduce agricultural and urban runoff and improve wildlife habitat. Securing more than $1 billion for the Great Lakes Restoration Initiative for restoration projects, research and public outreach; includes working to reduce the impact and establishment of invasive species such as Asian carp and protecting the shoreline from severe landscape changes due to logging, agriculture and urban development. Future announcements will be made as programs are developed and implemented. Visit WorldFishingNetwork.com/americas-great-waters for more information. The health of our national parks is directly linked to the health of the waters that surround and flow through them. NPCA’s America’s Great Waters program was founded in 2009 to support a larger national effort to protect, preserve and restore our nation’s most iconic waterways, which run through and surround America’s 401 national parks. The program actively works to increase funding and advance federal policy priorities to protect and restore America’s most iconic waterways for the benefit of the natural resources and local economies that depend upon them. Much of this work is accomplished through NPCA’s leadership in the America’s Great Waters Coalition (AGWC), an alliance of organizations working to protect, preserve and restore our nation’s Great Waters as well as other leadership roles in water-specific coalitions such as the Everglades Coalition, Healing Our Waters – Great Lakes Coalition and Choose Clean Water Coalition. For more information, please visit, //www.npca.org/protecting-our-parks/air-land-water/great-waters/. Since 1919, the nonpartisan National Parks Conservation Association has been the leading voice of the American people in protecting and enhancing our National Park System. NPCA, its 800,000 members and supporters, and many partners work together to protect the park system and preserve our nation’s natural, historical, and cultural heritage for our children and grandchildren. For more information, please visit www.npca.org.